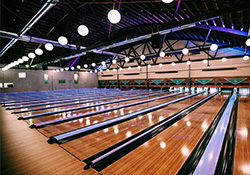 "South Bowl is a multi-functional events & bowling venue. This completely renovated former cold-storage warehouse now houses 26 state of the art Qubica AMF bowling lanes. The uniquely designed, bi-level structure also includes two private bowling areas, two full size bars, a full menu including a wood oven pizza kitchen, billiards, darts, retro arcade games, and cool vintage seating."